Add some Champagne to that bubble bath to glow like Marilyn Monroe. Here's the thing about Champagne: It's only good for drinking when it's freshly opened, cold and sparkling in its glass. If the New Year's Eve celebration got a little out of hand, and you have some opened bottles that lasted longer than your guests, fear not: There are still plenty of delicious ways to keep the party going. 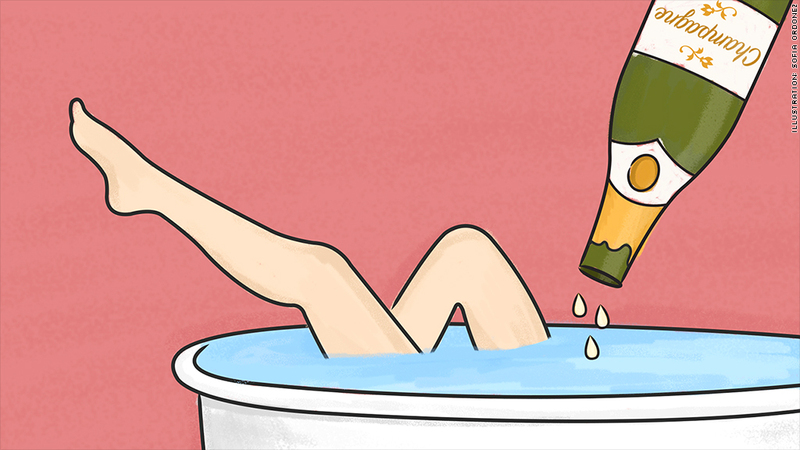 Channel Marilyn Monroe, who was rumored to bathe in 350 bottles of bubbly, taking advantage of the grape's naturally-occurring antioxidants. But if you don't have a few hundred bottles to spare, use a sip's worth for a natural toner. Michelle Phan, makeup artist and YouTube star, promises it will be "light, cool and refreshing." She wrote on her website, "Champagne is a favorite toner of mine for its detoxifying properties and its ability to fight free radicals." According to Phan, the acid also helps to even out skin tone. She suggests putting a small amount on a cotton pad and wiping it across the face. Parisian shoemaker Olga Berluti has said she finishes a shoe shine with Champagne, and directs her well-heeled customers to do the same. 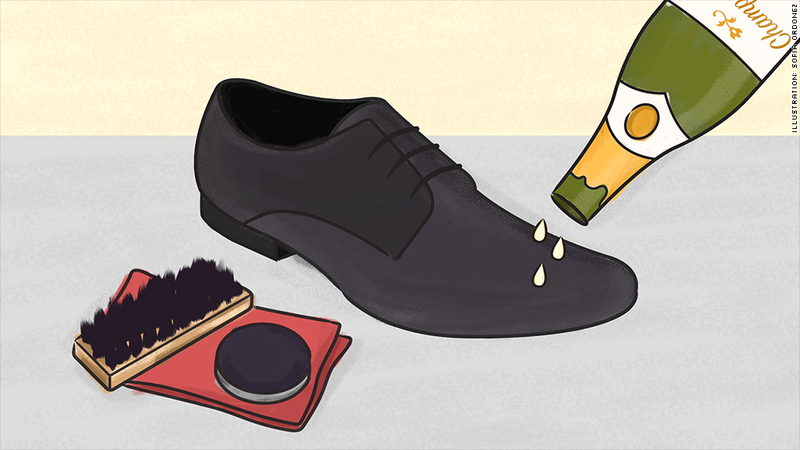 It's said to cut the fat in the polish, allowing the natural color of the leather to really shine. Though this may seem like an obnoxious practice of the 1%, there is some historical precedent. It dates back to the 1800s and a guy named Beau Brummell, who led the tailored-suit trend and liked his shoes with a bit of shine. According to a book by Carlo Maria Franzero, a young man once asked Brummell how he got his boots so buffed. He said he didn't use anything except the "froth of Champagne." Brummell was also the kind of guy who wore three fresh shirts a day and had them washed in the country to get a fresh smell. For that, I say just spray some Febreze. It's 2015. One of the best things about a big night out is brunch the day after. 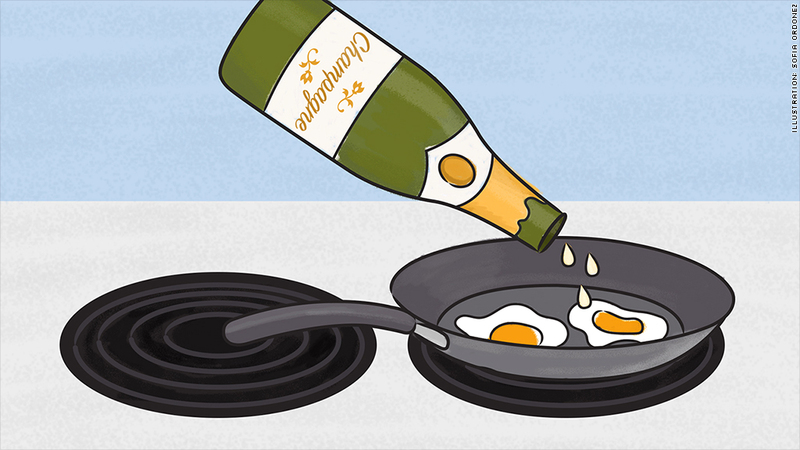 Flat sparkling wine can be added to scrambled eggs instead of milk for extra fluffiness, or you can use it like a white wine and add to sauces, salad dressings or desserts, according to David DiSalvo, a chef in New York City. "It'll make your food so much better," he said. "There's nothing wrong with cooking with it." Have a lot of opened bottles? He suggested making a beurre blanc, which is basically a butter sauce. Just put chopped shallots in a saucepan and add in the Champagne. Reduce it down by about a third and add a little cream. "Then add a little butter and whisk it until it becomes a creamy sauce that can go with anything," DiSalvo said. "It's beautiful with fish." 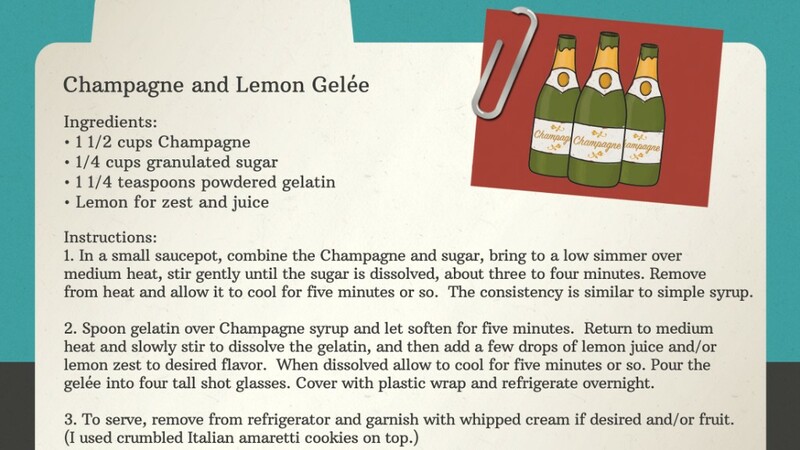 His other recommendation is a French gelée, which is just a fancy way of saying "Jell-O shot."